Only seems to show road/lane closures, and a few other minor works. Many thanks John for the link it's better than having nothing at all. I can confirm that Virgin Media is coming to Thanet (I do work for them) - we start in Garlinge next Monday and rollout the rest of Thanet over the next 18 months. An aggressive plan is in place to get the WHOLE of Thanet in Fibre to the premise network by August 2018. Look out for information events being held in the area and men spraying biodegradable paint marking the paths. They will also be working with big orange barriers and boards saying 'Virgin Media'.. so hopefully won't be hard to spot!! There will also be introductory offers and you register your interest in advance. Thanks for the update CLOKent and welcome to the forums. I registered my interest months ago, looking forward to having the option. There are roadworks scheduled for this week in the Hartsdown area, nothing showing for Garlinge yet though. Welcome CLOKent. Good to have somebody direct from VM participating on the forum. I think that the area is the Garlinge electoral ward. Still, first permits starting tomorrow, plenty more to come! Just a thought, but how does the physical connection work with VM. Do they install specific connection points in the pavement outside each house when they lay the fibre? When I built the house extension I ran a 15mm plastic conduit (which is hopefully suitable) from the outside wall to my server room in anticipation of FTTP, obviously there is an optimum point nearest to this in the pavement. Thanks for the confirmation, any way to make sure it's installed in a suitable location? Not really, unless you are around when they are doing the work. A guy will spray a T on the pavement and your swept tee where the fibre will break from the duct in the pavement and enter your property will go roughly there. For the install itself in common with BT they want to install a termination point on a wall then go through the wall into the property. I'm not sure how accommodating they can be for you but if it came to it it couldn't hurt to ask the question. Signed up specifically for this thread. Really happy we'll be able to get VM fairly soon (Especially considering my place or work pays for my internet!). I live between WWX and Westwood Industrial Estate. I've signed up for my interest to get Virgin and they stated that there are absolutely no plans currently to come to my area? 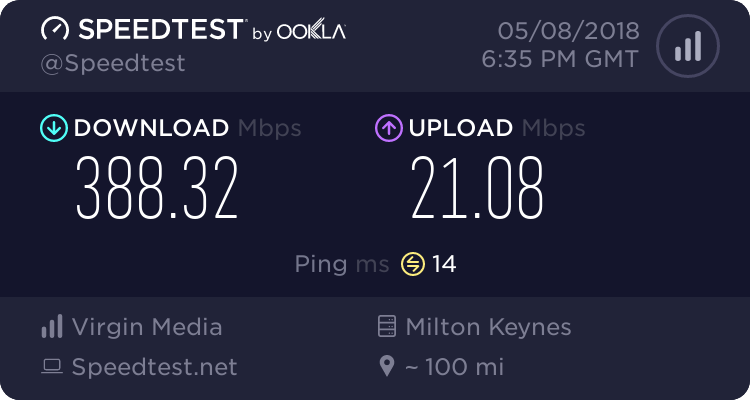 I find this a little strange since Virgin seem to currently be cabling down Poorhole Lane; a 5-minute walk from my house. Any thoughts/ideas?